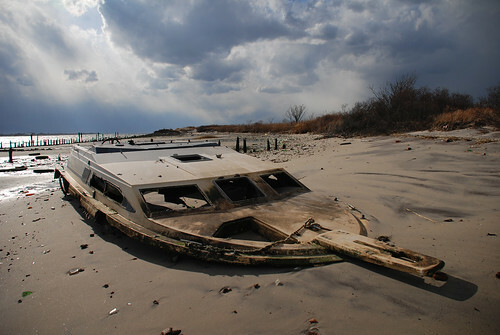 Dead Horse Bay lies at the southern edge of Brooklyn. Once a marsh, this area was slowly filled with rubbish. Its name comes from the carcasses from a nearby horse rendering plant that would wash up on its shore. The landfill was capped after the refuse of the 1920’s and 1930’s filled the marsh. In the 1950’s the cap burst, spewing the artifacts of a different era onto the beach. Now glass bottles, shoe leather, plastic toys, old bones and handguns lie revealed along the waters edge. We always called it BOTTLE BEACH…. We used to go over there and find the most beautiful and very OLD bottles. Can somebody give me directions on how I can find this bit of shore. I hear its near floyd bennet field. But i’ve never been over there.. I’d love to check it out.. I love historic items. You take the 2 to the last stop in brooklyn (flatbush ave), then the Q35 bus to the "last stop before the bridge." Just before you go over the rockaway parkway bridge. How does one get to Deadhorse Bay in Brooklyn via subway and bus from Manhattan? What’s going on with mow mow island? There were bobcats plowing down all the trees and vegetation in the center of the island. They’re also removing cherry and other fruit trees the local birds depend on. Does anyone know what they’re planning to do back there? Karla, WHERE HAVE YOU BEEN?? I went there a couple of days ago and got covered in ticks! Did you have any problems with bugs?? We had to leave early there were so many. It was around 3pm too!